Many consider real estate the most important indicator of the health of the Philippine economy. Asia Real Estate Summit is the largest non-aligned event for the industry in Philippines. You name was referred to us by people who speak very highly of you. The purpose of the event is to highlight the contributions of the property sector to the nation's economy and update the region on the amazing progress of Philippines. Find out what's ahead and how you can benefit at Asia Real Estate Summit 2018 on Tuesday, April 24 (9:00am - 4:30pm) at the Manila Marriott -- a full-day event. REGISTER HERE. The price of admission is Php5,000 and includes sumptuous lunch and hors d'oeuvres -- Php6,000 if paid at the event. HANNAH YULO of DoubleDragon will shock and awe on development progress by the fastest growing real estate company in Philippine history. EVAN MCBRIDE of Udenna will shock and awe about on Philippines' other fastest growing real estate company in Philippine history. EPIMACO DENSING of DILG will show how nothing will stop the government's comprehensive plans to save Boracay. CYNDY TAN will describe the vast opportunities of tourism development across Philippines (in case Boracay can’t be saved). MEGAN WALTERS of JLL Asia will show the megatrends coming around the corner to Philippines. ARNEL CASANOVA of Aecom will talk about his gigantic community development projects. CARY LAGDAMEO of Damosa Land will focus on the many growth opportunities open to everyone in the south of the country. BHAVNA SURESH of Lamudi will show how technology will eliminate so many hassles and costs in real estate deal making. 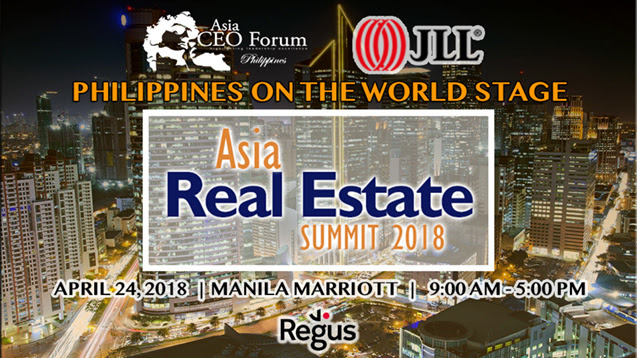 Be with us for Asia Real Estate Summit 2018, presented by JLL, with Elite Sponsorship by Regus. Asia CEO Events organizes the largest business forums and summits across Philippines (Metro Manila, Cebu, Davao, Clark), including the nation's dominant business awards event, Asia CEO Awards (see www.asia-ceo.org and www.asia-ceo-awards.org). Past speakers include President Rodrigo Duterte, Vice President Robredo, Secretaries Cusi-Teo-Tugade-Lopez, etc. the heads of most of the nation's largest business organizations (plus celebrities: former Miss Universes Quiambao-Moran, Olympic Medalist Hidilyn Diaz, on and on).